My grandmother said this was "Imari"
My grandmother gave me this platter. She said it was Imari, and she would have acquired it sometime around the 1940s in Japan. It is rather large, I forgot to measure it, but it is at least 24 inches in diameter, maybe larger. The only marking I see is a blue mark on the back that looks like a small shell. 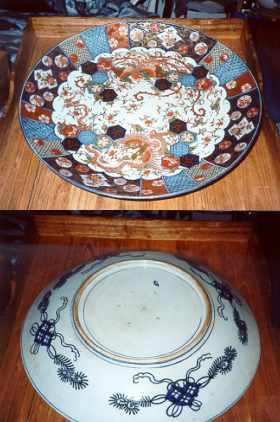 Could you give me some more information on this platter? Also, is there a good way to display it? I am afraid to hang it, I live near Seattle, where we are waiting for the big earthquake to hit! Right now it is useless in my closet. There is not much to be added I am afraid. Your grandmother was perfectly correct. Imari is the name commonly used for porcelain decorated in this way, with underglaze blue plus enamels. Imari is actually the harbor city from which most Japanese porcelain was shipped out from. This and actually most Japanese porcelain was and still are made in the Arita area. Regarding the age I would have felt that you nice plate was made during the latter part of the 19th century but I am not sure, and I will keep your grandmothers purchase date in mind for further reference. Regarding displaying in preparation for an earthquake, I would personally felt that a padded box in the basement would have been the best. Regarding further safety I actually think it is ok to use a big charger like this as long as you avoid steel cutlery and strong detergents, especially those intended for machine washing. The enamels are a bit soft but the porcelain is as good as any we could make today. Thank you for sharing your nice piece with me.